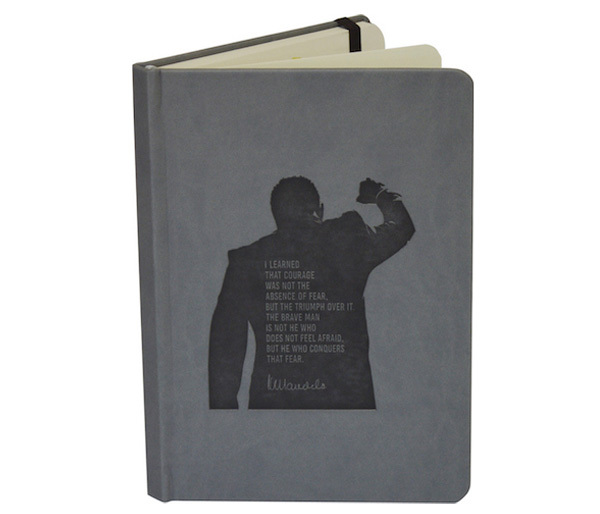 Nelson Mandela Quote Notebook, these Eco Journals and Notebooks with Nelson Mandela inspirational quotes are made in South Africa, Italian Leatherette Notebook with 192 Lined Eco Pages, a Nelson Mandela inspirational quote appears on the front cover of each Mandela Eco Journal and Eco Notebook, there are 5 different Mandela inspirational “quote” options and 13 different journal cover colours, the Notebook is 148 x 210 mm and the Journal is 130 x 210mm. The MOQ for branding your corporate logo is 50 units. This is an Official Licensed Mandela Product and a percentage of the sales go to the Nelson Mandela School Library Project and Literacy programme in South Africa. These high quality locally manufactured journals and notebooks also have an eco diary option.